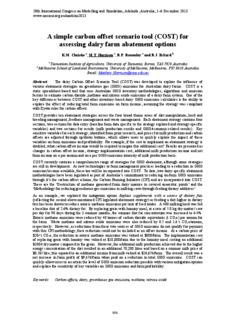 The dairy Carbon Offset Scenario Tool (COST) was developed to explore the influence of various abatement strategies on greenhouse gas (GHG) emissions for Australian dairy farms. COST is a static spreadsheet-based tool that uses Australian GHG inventory methodologies, algorithms and emission factors to estimate carbon dioxide, methane and nitrous oxide emissions of a dairy farm system. One of the key differences between COST and other inventory-based dairy GHG emissions calculators is the ability to explore the effect of reducing total farm emissions on farm income, assuming the strategy was compliant with Kyoto rules for carbon offsets. COST provides ten abatement strategies across the four broad theme areas of diet manipulation, herd and breeding management, feedbase management and waste management. Each abatement strategy contains four sections; two sections for data entry (baseline farm data specific to the strategy explored and strategy-specific variables) and two sections for results (milk production results and GHG/economic-related results). Key sensitive variables for each strategy, identified from prior research, and prices for milk production and carbon offsets are adjusted through up/down buttons, which allows users to quickly explore the impact of these variables on farm emissions and profitability. For example, if the cost to implement an abatement strategy is doubled, what carbon offset income would be required to negate this additional cost? Results are presented as changes in carbon offset income, strategy implementation cost, additional milk production income and net farm income on a per annum and on a per GHG emissions intensity of milk production basis. COST currently contains a comprehensive range of strategies for GHG abatement, although some strategies are still in development. As new technologies or farm management practices leading to a reduction in GHG emission become available, these too will be incorporated into COST. To date, two dairy-specific abatement methodologies have been legislated as part of Australia’s commitment to reducing on-farm GHG emissions through it’s the carbon offset scheme, the Carbon Farming Initiative (CFI) and are incorporated into COST. These are the ‘Destruction of methane generated from dairy manure in covered anaerobic ponds’ and the ‘Methodology for reducing greenhouse gas emissions in milking cows through feeding dietary additives’. As an example, we explored the mitigation option Replace supplements with a source of dietary fats (reflecting the second above-mentioned CFI legislated abatement strategy) as feeding a diet higher in dietary fats has been shown to reduce enteric methane emissions per unit of feed intake. A 400 milking herd was fed a baseline diet of 2.6% dietary fat. By replacing grain with hominy meal, at a rate of 5.0 kg dry matter/ cow per day for 90 days during the 3 summer months, the summer diet fat concentration was increased to 6.4%. Enteric methane emissions were reduced by 40 tonnes of carbon dioxide equivalents (t CO2e) per annum for the farm. Waste methane and nitrous oxide emissions were also reduced by 0.5 and 1.6 t CO2e/annum, respectively. However, as reductions from these two sources of GHG emissions do not qualify for payment with this CFI methodology, their reduction could not be included as an offset income. At a carbon price of $20/ t CO2e, the reduction in enteric methane emissions was valued at $800/farm. The implementation cost of replacing grain with hominy was valued at $18,000/farm due to the hominy meal costing an additional $100/t dry matter compared to the grain. However, the additional milk production achieved due to the higher energy concentration of the diet resulted in an additional 70,200 litres and based on a summer milk price of $0.38/ litre, this equated to an additional income from milk valued at $26,676/farm. The overall result was a net increase in farm profit of $9,476/farm when paid on a reduction in total GHG emissions. COST can quickly allow users to ascertain the level of GHG emission reduction possible with various mitigation options and explore the sensitivity of key variables on GHG emissions and farm profitability.